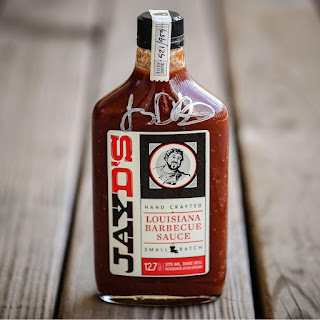 I’ve talked about my husband's Louisiana roots before, so I am thrilled to be able to work with Jay D’s Molasses Mustard. Jay Ducote was my favorite Food Network Star contestant. I loved the dishes he created and his personality. I hope that you find my Cajun Seven Layer Dip with Jay D’s Molasses Mustard delicious with all those wonderful Cajun flavors you desire. 1. Melt butter in large saute pan, medium heat. Add thawed crawfish tails, garlic and lemon juice. Saute for 2-3 minutes until crawfish fully cooked. 2. Turn off heat and add the 1/4 cup of Jay D’s Molasses Mustard. Coat crawfish tails. Set aside. 3. Cream together cream cheese and mascarpone. 4. Strain crawfish tails, then fold into cream cheese/mascarpone mixture. 5. Spread mixture into small shallow serving dish. 1. Grab another saute pan and brown andouille sausage. 2. Drain and rinse can of small red beans. Add to andouille sausage and cook for 1 minutes. 3. Place sausage/bean mixture on top of cream cheese/mascarpone mixture. Add layer of shredded lettuce. Add layer of diced tomatoes. Last layer, black olives. I just scatter a few. Garnish top with additional Jay D’s Molasses Mustard. Enjoy with your favorite cracker, corn chip or veggie!